“Nothing In Life Is Free!’ You’ve probably heard that phrase uttered many times to ungrateful children and teenagers. Well, it a philosophy which works wonders with dogs too. NILIF is one of the best dog training methods around and particularly if applied from puppyhood, will help you raise a happy, confident, balanced – and obedient dog. NILIF stands for Nothing In Life Is Free and is essentially a system of interacting with your dog where you teach the dog that he has to earn everything he wants and values in life. This means that the dog no longer gets things simply because he demands it – whether it attention, toys, play or treats – and that you control all the resources. The NILIF system is a great way to establish yourself as pack leader without having to use any kind of physical force or coercion and it quickly teaches your dog to respect your authority. NILIF is extremely effective for a wide range of behavioural problems in dogs – from the usual cocky adolescent who is challenging his boundaries to the nervous, shy dog who is anxious due to inconsistent leadership. In both these cases, the dogs can relax and behave better, knowing that the leadership position is secure and that you are in charge. The first step of implementing the NILIF programme is to stop giving your dog attention whenever he demands it. If he comes to paws you, nudge him, lick you, bark at you or otherwise pester you for attention, simply ignore him. Don’t even tell him “No” or try to push him away, as these are still forms of attention. Pretend you don’t notice him – don’t even make eye contact. Be prepared for your dog to become more persistent before he gives up. This is called an “extinction burst” and often happens when a result you are used to suddenly no longer happens. Humans will display this behaviour too. For example, imagine a machine that dropped a coin out of its slot every time you pressed a button. If it suddenly stopped doing that, you wouldn’t just give up - you’re very likely to keep pressing the button very hard, several times, maybe even slam or kick the machine in frustration, before eventually giving up. This is the same for dogs and if they are used to being rewarded for a behaviour, they will keep doing that behaviour harder before finally giving up. So it is important to stay strong and not weaken and “give in” to the dog out of exasperation because this will only make him try even hard next time. The second step of the NILIF programme is to show your dog that you have the power. This is done very simply and without the use of physical force, simply by showing the dog that you have control over all the resources. You control all the wonderful things in your dog’s life, whether it is food, play, attention, walks, opening the front door…all these things only come from you and now have to be earned. Your dog will never respect you as pack leader if he always gets these things for free. However, he will have tremendous respect for your authority if he has to do something for you each time he wants something. Your dog doesn’t have to do anything complicated to earn his rewards – it can be a simple “Sit” before his food bowl is placed in front of him or a simple “Down” before you throw the ball for him to fetch. He may have to Sit calmly now before his leash is attached and the front door opened for his walk. All of these things not only teach your dog to respect your authority and to value what he is given. 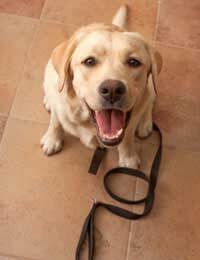 It doesn’t necessarily have to be Obedience commands either – you can ask your dog to do anything you like – such as a fun trick – as long as he has done something you asked to earn what he wants. Many people misunderstand the NILIF system and think it means depriving your dog of your attention and affection. This is not true at all. You can still give your dog as much attention and cuddles as before – but simply on your terms. You can still let your dog sleep on your bed if you wish – except that he now has to wait for your invitation before he can hop on and he has to get off when you tell him so. These simple routines and rules will prevent many problems people often have with adolescent dogs trying to challenge leadership and push boundaries. And for a dog that has been allowed to believe itself dominant over its humans, simply enforcing these new NILIF rules will be a very effective way of demoting him.